© Jean de Pomereu paints a portrait of Li Yuansheng, leader of the Dome A traverse and construction team. It is a long way from the steppes of Mongolia to the East Antarctic Plateau. But in many ways, these vast, windswept landscapes have things in common. 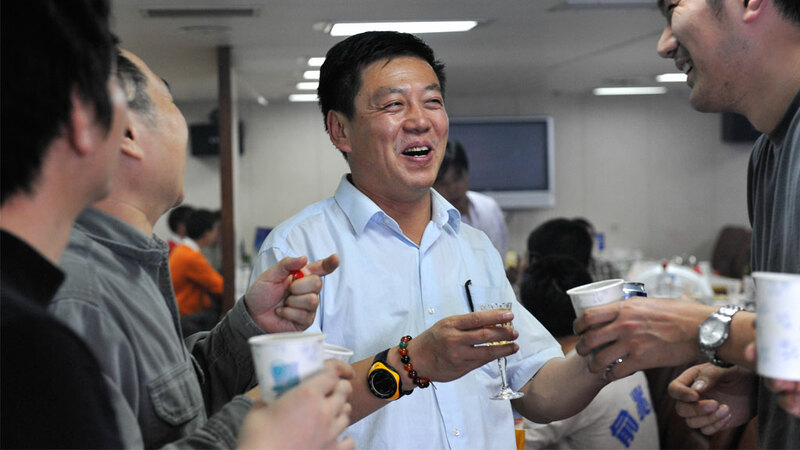 Perhaps this is why Li Yuansheng, leader of the Dome A station traverse and construction team, feels so at home here. Born in Huhehaote, close to China's border with Mongolia, Mr Li has a warm, easy smile, but also a very determined handshake. Observing him on board the Xue Long during the crossing from Freemantle, you can see how he has gained the respect and trust of his team and colleagues. After graduating with a degree in geochemistry from Nanjing University and working as an assistant lecturer for four years, Mr Li entered the Chinese Academy of Geochemistry in 1986. He worked there for 10 years until 1995, when he joined the Polar Research Institute of China (PRIC) in Shanghai. At PRIC, Mr Li changed his focus to ice core research and near-surface ice structure and dynamics. Li Yuansheng's Antarctic experience goes back to 1996, when he joined Japanese ice core scientists working at Dome Fuji (Dome F) on the East Antarctic Ice Sheet as part of a cooperation and scholarship exchange programme between China and Japan's National Institute of Polar Research. During his summer working at Dome F, he learned a great deal about Japanese ice coring techniques and analysis, as well as about logistical operations and the traverses necessary to get to such a remote location. It was an experience that would prove invaluable as his career evolved. In 1997, Mr Li returned to Antarctica as a member of the 14th Chinese Antarctic Expedition, where he lead his own 500-kilometre motorized inland traverse in the direction of Dome Argus (Dome A) to retrieve a series of shallow (50 metre) ice cores. He returned again in 1998, this time to lead a small team that penetrated 1,100 kilometres inland, turning back less than 200 kilometres from Dome A. It was these two expeditions that paved the way for Mr Li to lead the first Chinese traverse expedition to actually reach Dome A (altitude of 4,094 metres) in January 2005. Although it took as much as 25 days for the three snow tractors pulling heavily laden sledges to cover the 1,228 kilometres between Zhongshan Station and Dome A, this traverse was a turning point for the Chinese Antarctic Programme and its logistics, and it paved the way for this year's mission to build Kunlun Station. Although this year's expedition will be much bigger and better equipped than the previous ones (more on that in future reports), the challenges will also be much greater. Whereas past Chinese expeditions have never stayed at Dome A for more than two weeks, this year the team's 28 men are scheduled to remain on-site for a minimum of one month in order to complete the station's first phase of construction (or about 230 m2 of living and working space). There, they will work long hours in extreme environmental conditions where temperatures can drop to -45°C, and air pressure (due to the Earth's centrifugal force as it spins on its axis) is closer to that found at 5,000 metres in the Andes or Himalayas. Still, Mr Li does not seem worried by the magnitude of the task ahead. He even exudes an air of modest confidence that the job will be done, that "it has to be." For him, as for many Chinese and international scientists, the scientific value of Dome A is easily worth all the effort. Of course for Mr Li, a glaciologist and ice core specialist, the "Holy Grail" of Dome A is the possibility it presents to drill and retrieve an ice core containing more than 1 million years of climate and atmospheric history. (And this even if he is the first to recognize the value of Dome A to other fields of research, such as astronomy). Before launching that project, however, he explains that China first plans to drill a 500 metre ice core to evaluate the age of the ice, as well as snow layering and stratification, before the drilling of the deep ice core in years to come. This will be done using a Japanese shallow ice coring system which they value for its speed and light weight. Mr Li expects that the analysis of the deep ice core will eventually be done in collaboration with Japanese, European and US colleagues. When asked how many times he intends on returning to Dome A to carry out his work, Mr Li smiles and replies that each time he has returned from an East Antarctic traverse, he has sworn he would never go back: 'it was just too hard'. But then, each time as he recovers, new opportunities and possibilities arise, and the scientific value of the place and what can be achieved there comes into sharper focus. So, of course, this means he will go back as many times as the opportunity shows up: However difficult it may be, this line of work is just too interesting. However difficult it may be, this line of work is just too interesting.